This past weekend we went to a friend's house and I helped her make this salad to serve for dinner. She invited a few guests over and we had fun chopping and roasting veggies together in the kitchen. The weather has finally turned a little bit cooler and this salad was the perfect introduction to fall. 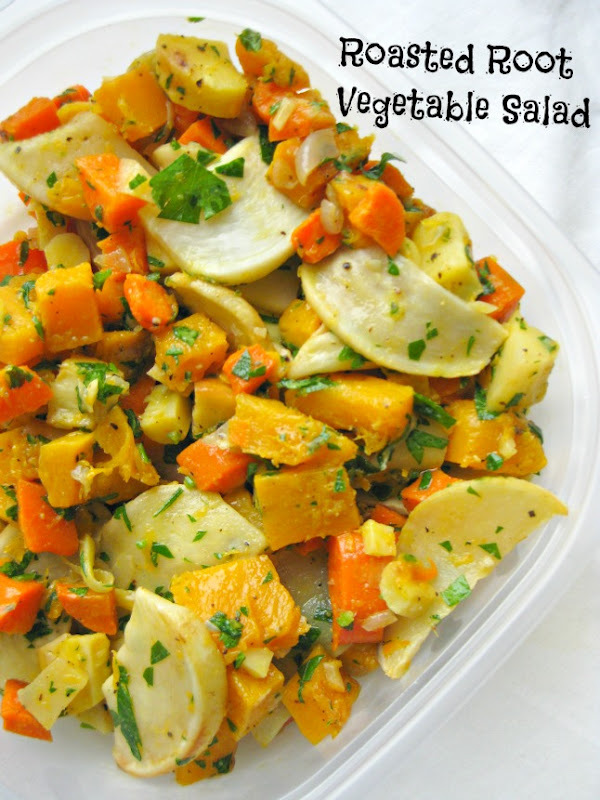 It features all those delicious veggies that beg to be used this time of year- butternut squash, parsnips, turnips and carrots. The veggies are roasted in the oven with some shallots and then mixed with a delicious vinaigrette. This salad was a definite favorite at dinner. 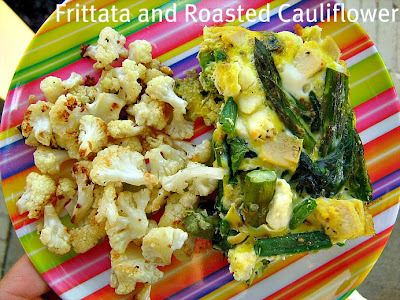 It is a nice side dish and is so delicious! Ever since I discovered the fact that I like sweet potatoes last fall, I have been buying a couple every few weeks and cooking them in the microwave to use throughout the week. I even planted some sweet potato plants in my garden. 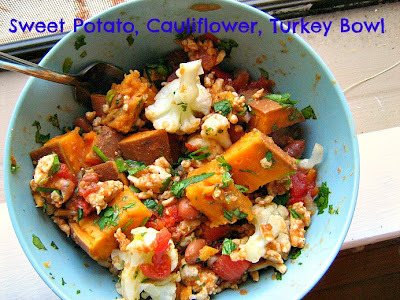 I happened to have some sweet potato chunks in the fridge when I saw this recipe and I decided to make it for dinner. 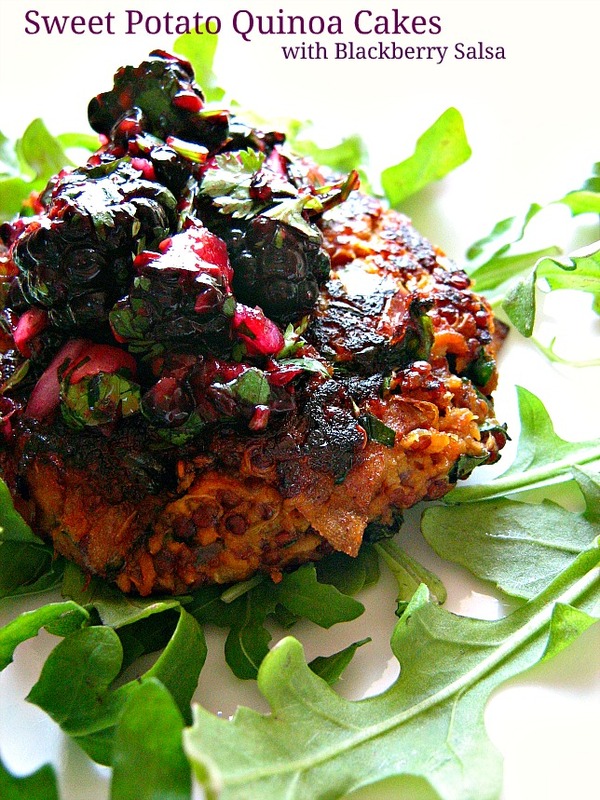 I have made the quinoa patties that this recipe is adapted from (and they are superb! ), so I knew these would be delicious. They were easy to make and the salsa was the perfect topping. Other people in my family are not fans of sweet potatoes, but I didn't mention that these quinoa cakes contained sweet potatoes and no one really noticed too much. My youngest daughter had a little bit of trouble finishing hers, but the rest of us liked them. I liked them a lot. My son brought home a sheet of paper that told me he had volunteered to bring a dessert in for the last day of school. I knew, without even asking him, that he wanted brownies. He decided he wanted me to try a new brownie recipe, instead of the usual Mint-filled Brownies (from Martha Stewart's Cupcakes) that I make for his birthday every year. 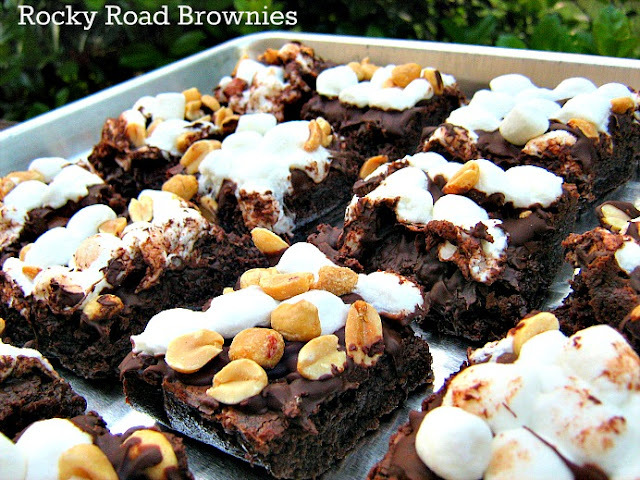 We looked at a couple recipes on the internet and as soon as he saw this one for Rocky Road Brownies, we didn't have to look any further. The brownie batter comes together quickly and the chocolate chips, marshmallows and nuts are layered on top after they have almost completely baked through. I made them the night before and the melted chocolate chips hardened into a nice, almost solid chocolate layer that could've passed for a frosting of some sort. My self control was in high gear the night I made these and I didn't try even a nibble. My family each tried a small bite and declared them delicious. My son said they disappeared at school before he could even take one! My kids like to look at cookbooks almost as much as I do. Well, maybe not quite as much, but they do enjoy flipping through and marking recipes that they want us to make together. A week ago, my 7-year old daughter marked quite a few recipes in this Mom and Me Cookbook and she asked if we could get the ingredients and make them for dinner. The first thing she wanted to make was this Avocado Frog Dip. 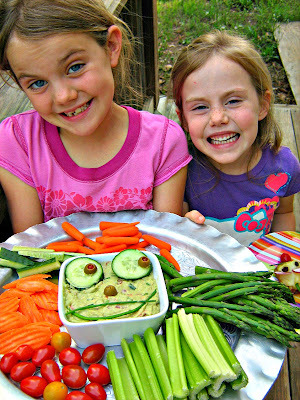 It is a basic guacamole dip and my girls had lots of fun making it with me. It was quite easy. We took turns cutting and scooping out the avocado, mashing it and stirring in a few other ingredients. 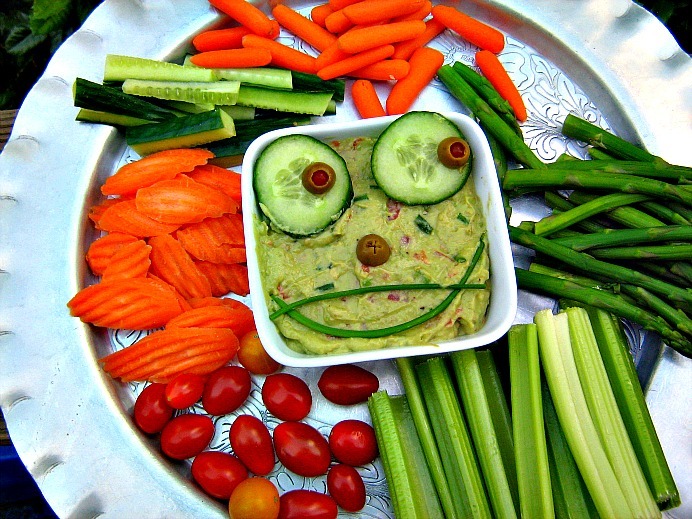 Then my girls wanted to get a pretty tray and arrange all the veggie dippers and make the face. I thought it turned out great. My kids aren't huge fans of avocado, but they ate this with the veggie dippers because "It's good for me" and "I know it's healthy". They said it, not me! They actually both ended up liking it more than they originally thought they would and we had fun putting it together. We made the dip while the potatoes were baking in the microwave. To complete our meal, we made these Potato Mice. We baked them in the microwave, so that the prep time wouldn't be quite as long. Our potatoes were pretty small, so we didn't use as much butter or milk as the recipe called for. We just used a little bit of each, and mashed it together until the texture was perfect. 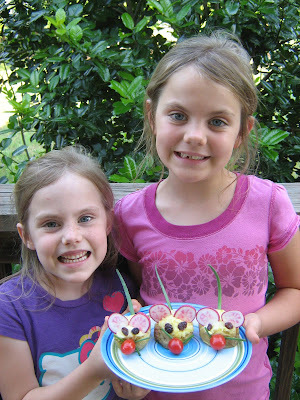 These were tasty as well and the girls were very proud of the dinner they helped me make. My kids love having breakfast for dinner. They think it is so much fun. A few weeks ago I found this recipe for Buttermilk Waffles with a fresh strawberry topping in Shape Magazine and I ripped it out because I really wanted to try it. It comes from Ellie Krieger, whom I absolutely love, because her recipes are healthy and they always turn out to be very delicious. Plus, she uses mostly low-fat buttermilk instead of a ton of oil or butter, which is something I do all the time when I make quick breads or muffins. I also really liked that she only used honey to sweeten the waffles as well as the topping. I made the topping a few days in advance when I was cutting up strawberries for something else and I am glad I did because I think it tasted great chilled. I doubled the recipe for the waffles, so that I could freeze some for a quick breakfast option on school days and I was really glad that I did that too. 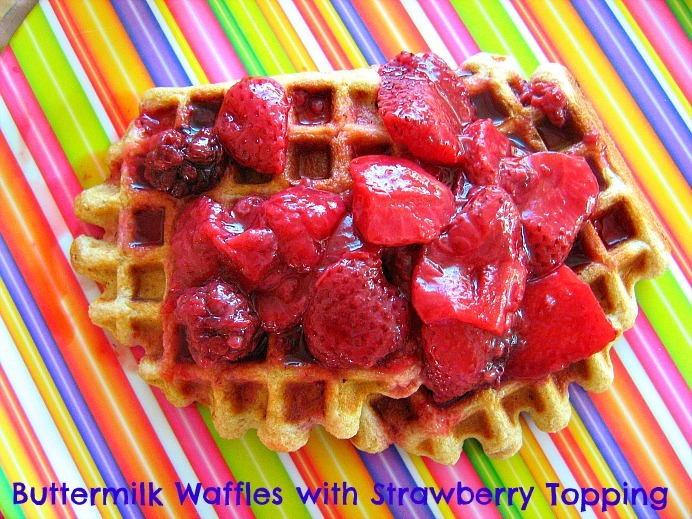 These were yummy and the sauce was perfect with the waffles. In a medium bowl, whisk together the dry ingredients (flour through salt). In another medium bowl, whisk together the egg, buttermilk, oil, honey and vanilla. Coat the waffle iron with cooking spray. Ladle enough batter to cover 3/4's of the surface, close lid, and cook for 3 minutes or until golden brown. Repeat with remaining batter. Serve topped with strawberry mixture and an optional dusting of powdered sugar. 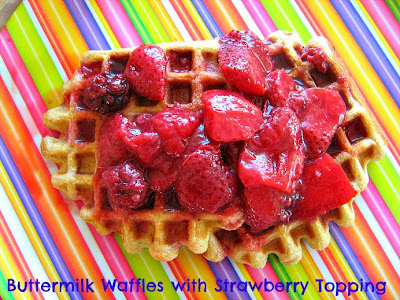 In a medium saucepan over a low flame, stir together strawberries, lemon juice, maple syrup, and bring to a gentle boil. Reduce heat to medium-low and simmer for 5 minutes, until the liquid has thickened slightly. Flavor with additional maple syrup if desired. Remove from heat and set aside. Mini Meatball Pita Pizzas- I made extra mini meatballs when I made Homemade Spaghetti-O's and Meatballs and put them in the freezer for a later date. 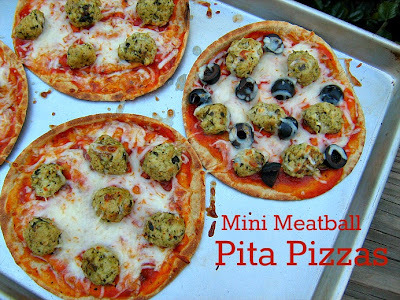 A couple of weeks later I quickly sauteed them with a little chicken stock and turned them into mini pizzas. We used whole wheat pitas as the crust and dinner was ready in no time at all. I combined 2/3 cup leftover ground turkey breast/ pinto bean mixture, with 1 cup cooked sweet potato, 1 cup steamed cauliflower, 2 Tbls chopped cilantro, and 2 Tablespoons salsa. There isn't a child in my home who still watches Sesame Street, but that didn't matter to me when I saw the new book- B is for Baking . This cookbook uses the characters from Sesame Street and I couldn't resist it. I have had C is for Cooking for quite a few years and we use it all the time. I made Sweet Potato Biscuits last fall that we really loved and I noticed the version in B is for Baking was a little bit different and that it didn't use butter at all. I was intrigued and decided it would be the first thing that we tried from this cookbook. I made them on a night that we had a family favorite for dinner. Whenever I make this stew, we have some sort of bread/biscuit to go with it and I knew these sweet potato biscuits would be great with it. They didn't have the exact texture of a normal biscuit, but they were soft and fluffy and we loved them. I froze a few of the leftovers and we made breakfast biscuit sandwiches the next week. I will be making these again! In a small bowl, whisk together dry ingredients (ap flour to salt). In a medium bowl, with a wooden spoon, stir together egg, oil, milk, and honey. Stir in the mashed sweet potato. 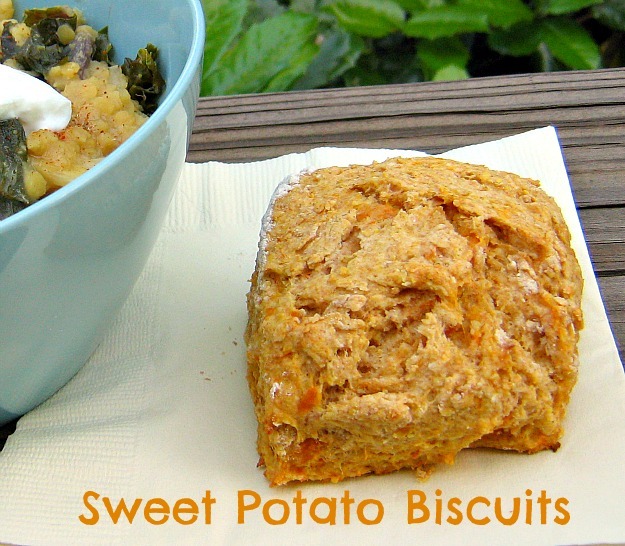 Gradually add the flour mixture to the sweet potato mixture and stir until just combined. Turn the dough out onto a lightly floured surface. With your fingers, gently pat the dough out to a 9*12-inch rectangle. Cut into 12 squares. Places biscuits on an ungreased baking sheet about 1 inch apart. Bake 10-12 minutes or until golden brown. Cool slightly on rack and serve warm. 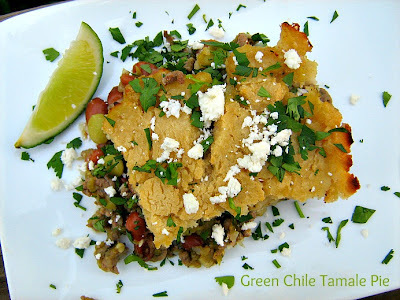 One of the other pies we had during Pie Week was this Green Chile Tamale Pie. I was intrigued by the recipe and had never eaten or prepared any sort of Tamale Pie, so it was a new adventure for all of us. I stuck to the recipe and used ground sirloin (shocker!) instead of subbing in lean ground turkey. I added some pinto beans and switched up the cheese I used on top, but other than that I stayed pretty close to the recipe. I had a little bit of trouble with the topping. The recipe said to "Dollop and spread" it on top of the filling. I actually had to roll mine out with a rolling pin and then transfer it to the top of the filling. I had a few little patches that I had to pinch together. Not too pretty, but it worked. I think my entire family was pleasantly surprised by this dish. 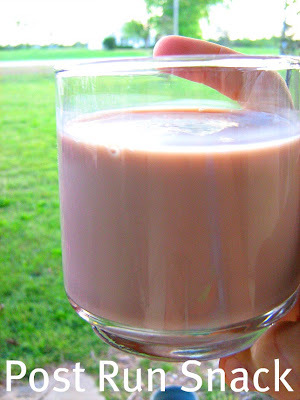 It had good flavor and was a fun twist on something we have never really tried before. A perfect addition to our very fun Pie Week! As part of Pie Week, I wanted to include some Breakfast pies. 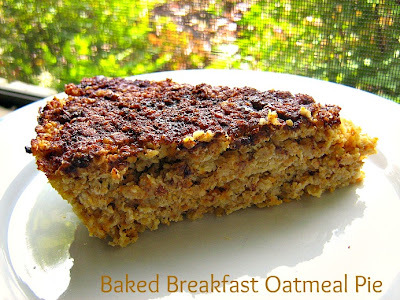 I found this recipe for Baked Breakfast Oatmeal Pie and just knew it would be perfect. My youngest daughter and I stirred together the ingredients the night before and the next morning I popped it in the oven while my kids were getting ready for school. It was perfect! 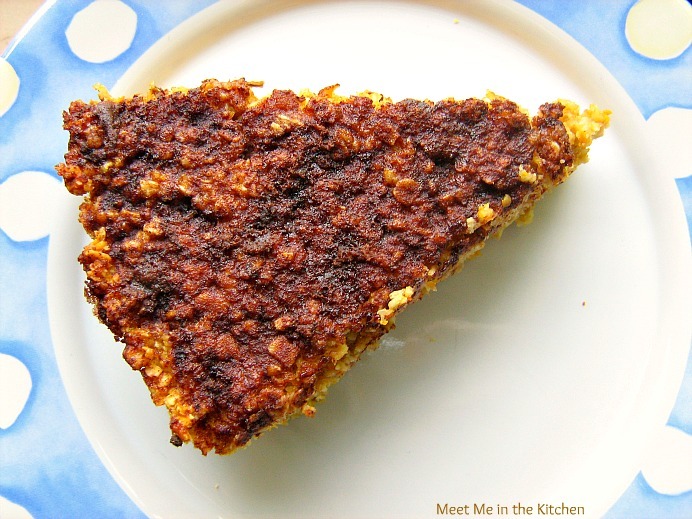 It is basically just a baked oatmeal recipe, but looks like pie because it is baked in a pie plate. I reduced the sugar by over half, just because my kids and I don't really like our oatmeal too sweet (I usually don't add any sweetener to my own) and used almond milk instead of normal milk. This was a big hit. My kids enjoyed a slice warm out of the oven and they loved snacking on the leftovers, cold, right out of the fridge. 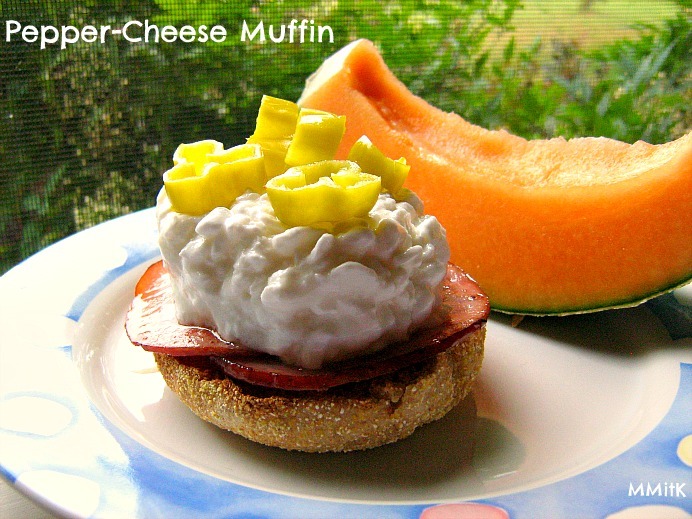 There are so many ways that you could make variations of this, like adding fruit or making a savory option. It really seems like there are limitless possibilities and it is super quick to throw together. 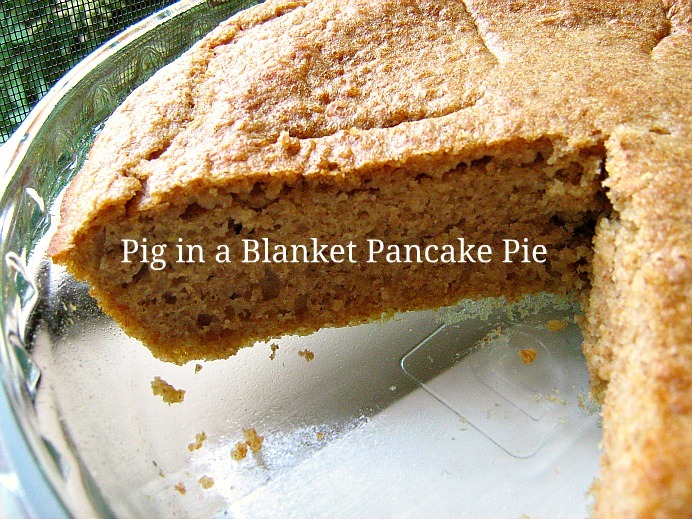 I also saw this Pigs in a Blanket Pie and thought it was just too funny to pass up. I whipped up some whole wheat pancake batter and put turkey sausage links into the batter. The only problem was that it took longer than I expected to bake through, so my kids had to wait until after school to eat it since it wasn't ready before they left. Fun idea though. I also used the filling from this recipe for Savory Breakfast Pies with Cheddar Cheese Crust , but used pizza dough as the crust. 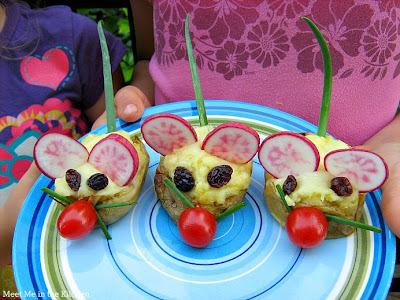 I made them for dinner and they were a big hit. I used canadian bacon instead of ham in the filling and also omitted the milk and used a little bit of oil instead of butter to cook the onion/veggies. They turned out really cute and my family loved them. I didn't get a picture quick enough though. They ended up looking like little calzones. I have a confession to make- up until last week, I had never, in my life, made Shepherd's Pie. I don't remember ever eating it before. My mom never made these types of dishes growing up. I've never been a "meat & potatoes" type eater, so it just never was something I was interested in making. 2 things changed that for me- Pie Week and Comfort Food Fix: Feel-Good Favorites Made Healthy by Ellie Krieger. 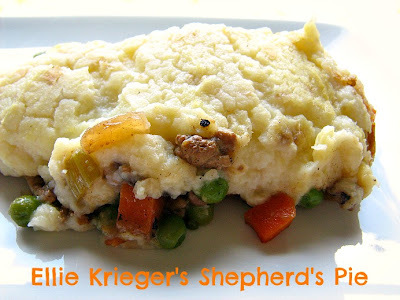 Ellie Krieger's recipes never, ever disappoint and I like that she uses a combination of cauliflower and potatoes for the mashed topping. I made a few changes, like using lean ground turkey instead of lean ground beef, but that is just because of my personal taste preferences. I actually put this together on a Saturday night and then covered it and put it in the fridge, so I could just pop it in the oven after church on Sunday and we wouldn't have to wait too long for a hot meal to be ready. A couple of weeks ago, my 10 year old son could not stop saying "I like Pie!". He said it after almost every sentence. He sang it. He yelled it. He repeated it over and over. He said a couple of friends at school had decided that was their new catch phrase. The only problem was, he didn't really like pie. Or at least he thought he didn't like pie. After hearing "I like Pie!" a million times at least, I decided that he was going to learn to love pie. I declared that we would be having Pie Week, where we would eat all sorts of different pies. Pie for breakfast. Pie for lunch. Pie for dinner. Sweet pie, savory pie. Any and every kind of pie we could come up with. I started researching pie recipes and set the menu for the week. He wasn't too excited to begin with. This was the first pie we had for dinner. 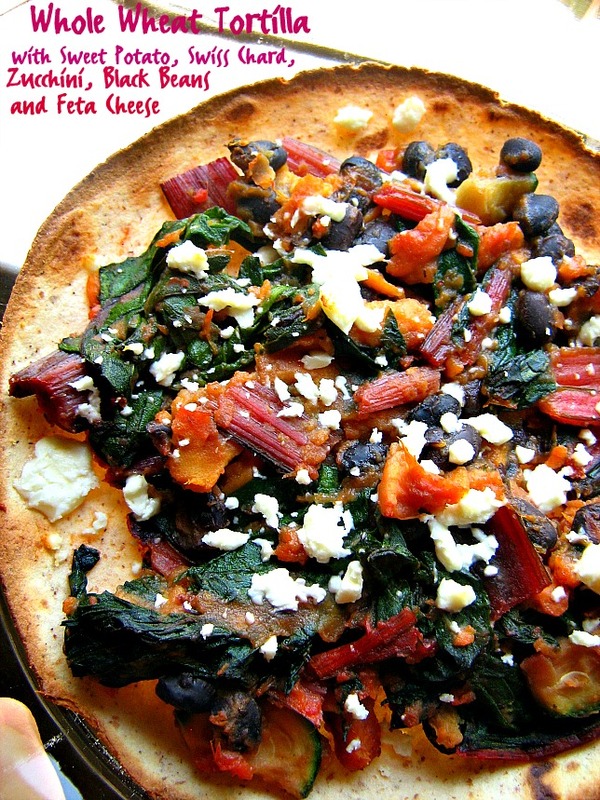 It has a phyllo dough crust and a filling of swiss chard, spinach, and onion. It was reminiscent of spanakopita, but mostly greens with a little bit of crust. We eat swiss chard and spinach all the time, so I didn't have a hard time convincing anyone to eat this for dinner. It was good and a fun way to start out our pie adventure. Bring 2 quarts water to a boil in a large Dutch oven. Add the chard and spinach; cook 2 minutes or until tender. Drain well. Place chard mixture on several layers of paper towels; squeeze until barely moist. Heat a large nonstick skillet coated with cooking spray over medium-high heat. Add onion; sauté 5 minutes or until tender. Add garlic; sauté 1 minute. Add chard mixture, dill, and parsley, stirring well to combine. Cook 1 minute or until thoroughly heated. Remove from heat. 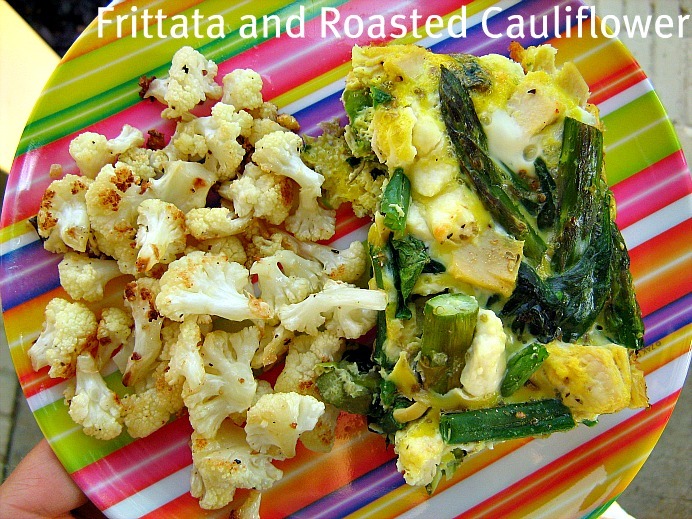 Combine chard mixture, cheese, eggs, and egg whites, tossing well to combine. Stir in pepper and salt. Place 1 phyllo sheet on a large cutting board or work surface (cover remaining dough to prevent drying); lightly coat phyllo sheet with cooking spray. Place phyllo sheet in a 9-inch pie plate coated with cooking spray, allowing edges to overlap plate rim. Repeat the procedure with 6 additional phyllo sheets, placing sheets in a crisscross design. 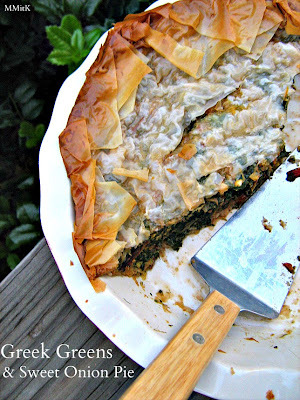 Spoon the spinach mixture over phyllo. Lightly coat each of remaining 3 phyllo sheets with cooking spray, and place sheets over spinach mixture in a crisscross design. Roll excess phyllo into the dish to create a decorative edge; press lightly to hold. Cut 4 (2-inch) slits in top of pie; cover with foil. Bake at 375° for 10 minutes. Uncover and bake an additional 30 minutes or until crust is crisp and golden. Cut pie into 8 wedges. In April, I drove to Washington D.C. with my children for Spring Break. My sister lives there with her children and it is always so much fun to visit them. We go on tons of outings and see so many amazing things when we are there. It's pretty great that so many of the museums, the zoo, and so many other activities are completely free! On Friday night, my sister took me on a Girls Night Out to Georgetown. The first thing we did involved enjoying gelato at Dolcezza ( I had blood orange and meyer lemon; my sister had salted caramel and apple cider), ate at a delicious pizza place (but I can't remember the name of it!) and then we did some window shopping. Our first stop was Dean & Deluca. I realize that some people might not find this type of store exciting, but let me tell you that I could've stayed in there all day long. It was fascinating to see so many beautiful foods and packages. You might be wondering at this point what any of this has to do with Homemade Spaghetti-O's and Meatballs. Well, when we were wondering around Dean & Deluca, I just happened to spy a cute little bag of ring shaped pasta. Anelloni to be exact. I had to have those cute little rings. I had been looking for them because this particular recipe was on my to-make list. (I will let you know that I did not pay as much for them in the store as the price that is listed online). I had found my must-have item and my sister was trying to decide what kind of treat to buy from the bakery section (She settled on a ginormous peppermint brownie that we shared the next day with both of our entire families-10 people- after a hike) . We made our purchases and went on our way. My little ring pasta made it back here to Georgia and this recipe was one of the first things I made for dinner once we were home. I didn't grow up eating canned Spaghetti-O's, but when I got married, I discovered that my husband really liked them. But only the ones with meatballs. I haven't eaten them, but he usually has some on hand, in case of an emergency. As soon as I saw this recipe on Tracey's blog, I knew I would have to try it, if for no other reason than just so my husband could compare the homemade taste to the can. 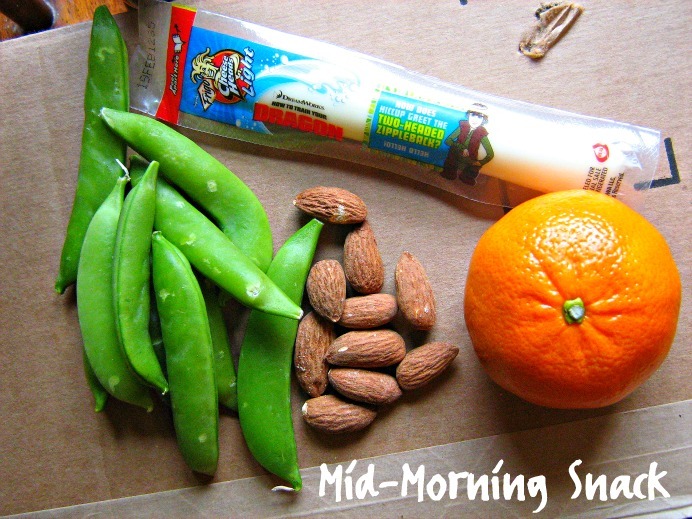 This homemade version is pretty easy and actually quite tasty. My kids really liked it and my husband seemed to enjoy it too. I made extra mini meatballs and froze them, so next time we want this yummy dish, part of it will already be ready to go. I made these crepes about 6 weeks ago and took a picture, even though I wasn't sure if I would be posting recipes anymore. I saw the recipe in Food Network Magazine- it was a little blurb about Giada's new cookbook. Crepes are something that we ate on Sunday evenings sometimes, when I was growing up. My mom would make a large stack of them and we would fill them with fresh or frozen fruit and a little sprinkle of powdered sugar. They were a special treat for us and I absolutely loved them. When I was a newly married person, about 11 years ago, I decided to make crepes for my husband. He wasn't a fan and I didn't want to eat a whole stack of crepes by myself, so I didn't make them again. It has been so long since I made crepes, I wasn't sure if I would be able to do it correctly! The good news is, that after a few messed up crepes that were too thick, too pale, and misshapen, I got the technique down and we were able to enjoy this meal as a Breakfast for Dinner. I made these on a night that I knew my husband wouldn't be home to eat with us, so there were no complaints at all. 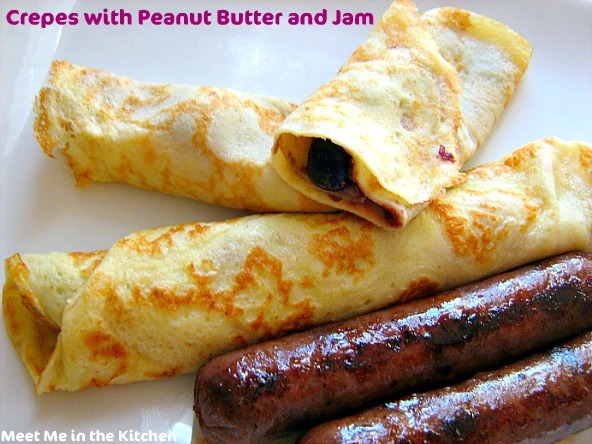 These were fun too because they were filled with peanut butter, jam (I used Crofters Fruit Spread) and fresh blueberries. I still have quite a problem with my bananas turning dark brown or black before I can use them all. I don't buy them for any other reason than to make smoothies, but somehow they always get the best of me. I'm super picky about eating a banana as is (it has to be fairly unripe and slightly green, not too sweet or mushy), so I feel like it is always a race against the banana. A few weeks ago, there wasn't any chance that I would use the bananas before they were ready to be transformed into a baked good. 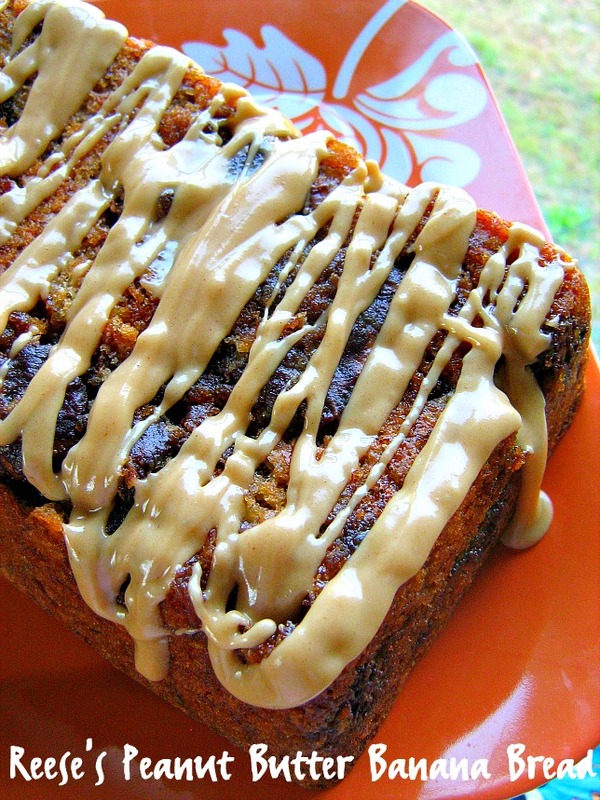 I've made just about every variation of banana bread there is ( I think I have made every Cooking Light version), as well as cakes, muffins, etc., so when I saw this recipe on Pinterest, I immediately decided it would be the perfect way to use my bananas. I knew I could send it to work with my husband, so there were not any worries about it being eaten. I never, ever use more that a 1-2 Tablespoons of oil when I make quick breads or muffins. I discovered that low-fat buttermilk can be a wonderful substitute that has less calories, less fat, but still makes things moist and delicious. I always use this method and I have never had any problem. I did cut a slice of this bread for my kids to try and I had a small bite. It was pretty good. 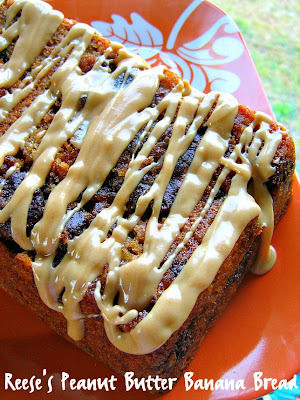 It could never dethrone my favorite banana bread recipe, but it was a fun twist. And, my husband brought home an empty plate, so I know that it was enjoyed by quite a few people. * The mini Reese's stuck to the bottom of the pan a little bit, so I had to get creative and make a glaze to cover some of the holes and spots I had to patch up. I always have the hardest time planning a menu when someone is coming over for dinner. I know I have mentioned this before, but I go back and forth between a million different things and it is enough to drive a person crazy! We were having some friends over for dinner and I somehow finally decided to make these stuffed peppers. They caught my eye because they had a different filling than other stuffed pepper recipes that I have seen and I thought they would be part of a fun meal. I'm not sure if I like prepping the actual peppers in the microwave, but I followed the recipe and did it anyway. I'm not really sure if this filling was the best thing to put in a bell pepper, because these were very hard to eat. They were good, but it was very messy and took a lot of effort to get a bite that had part of the pepper as well as the filling. Luckily our dinner guests were good sports and they didn't seem to mind too much. The filling was very good and would make a great dish by itself, maybe with some chopped red bell pepper added to the mix. 2. Trim about 1/2-inch off the tops of the bell peppers. Seed and core peppers. Place the peppers cut side down in a microwave safe glass baking dish. Pour in 1/2 cup water and cover with microwave-safe plastic wrap, venting one corner. Microwave on high for 8 to 10 minutes or until tender. Remove peppers from dish and set aside. 3. 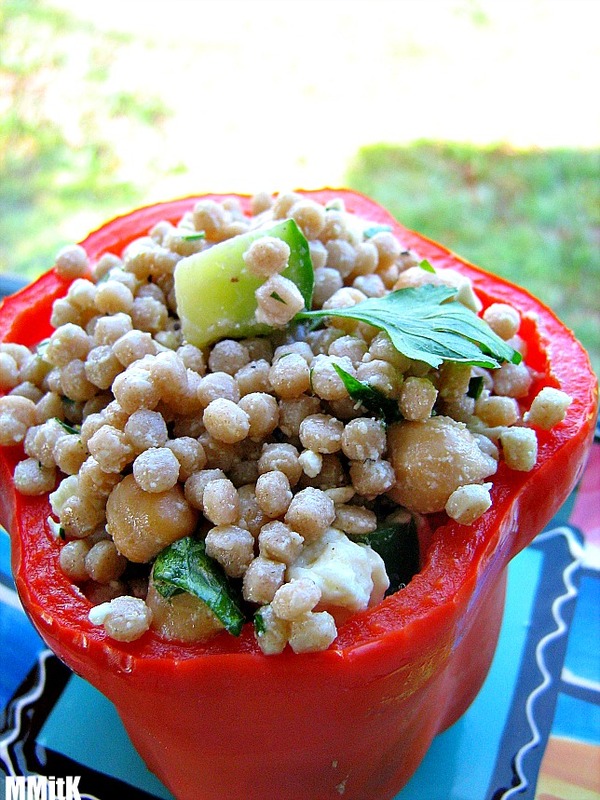 In a large bowl combine cooked couscous, chickpeas, cucumber, feta, scallions and parsley. Add lemon juice and olive oil. Stir to combine. Season with salt and pepper. 4. 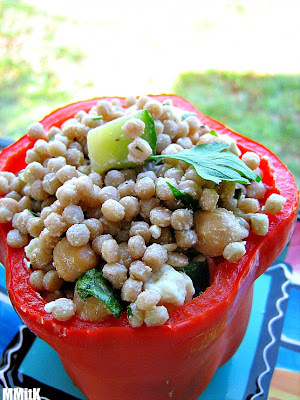 Stuff peppers with an equal amount of couscous mixture, about a scant cup in each. Serve at room temperature or chilled. I originally planned to post this a couple of weeks ago, but kind of forgot about it. I got an email from a reader who was wondering if I would post the types of things I am eating these days. One morning I woke up and decided to take a picture of everything I ate that day. Let me just say that this happened to be a really good day for me and I stuck to my goals of eating healthy. I also wanted to add that I don't usually drink chocolate milk or have it in the house, but my 5-year old really wanted to try TruMoo and so I bought a half gallon of it when we went grocery shopping. I've read things about it being a good post run snack, so I decided to give it a try. I found this recipe in a magazine. I tore it out and of course, could not, for the life of me, remember what magazine I tore it out of. Luckily for me, this recipe is all over the internet, so I felt okay about not remembering the specific magazine where I found this in the first place. I had never heard of The Counter, but from what I've gathered it is a burger place. 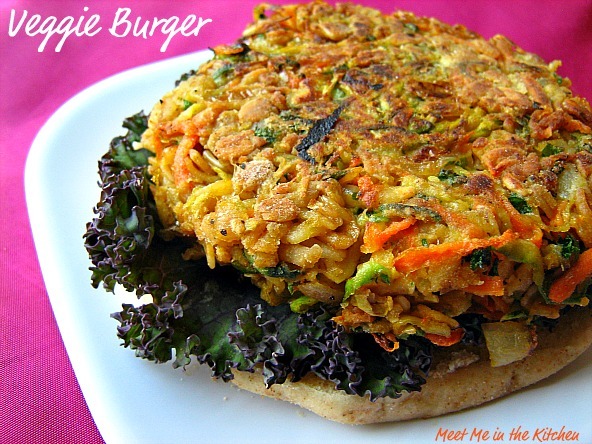 There were lots of rave reviews about this Veggie Burger and now I know the reason why. 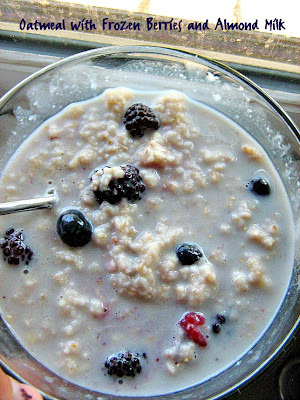 I really like how easy this recipe is and the fact that it contains wholesome ingredients. Sometimes Veggie Burgers are full of fillers and wierd things, but not these ones! The flavor and texture are wonderful. I made these the day before I cooked them and they were delicious. 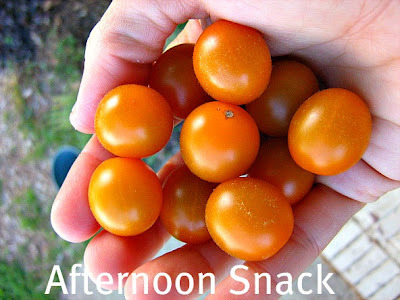 My friend who came over for lunch to enjoy these with me, liked them so much that she made them for her family as well. 1, In a large skillet, heat the olive oil until almost smoking, Add the onions and lower the heat to medium. Mix and then add the garlic. 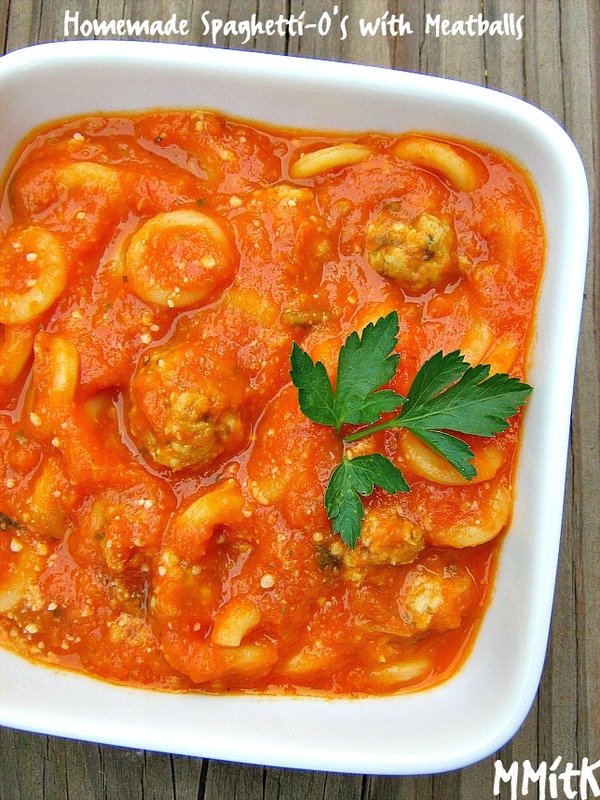 Cook until tender and soft. 2, Add the carrots, squash and zucchini and season. Cook for about 3 to 4 minutes until soft and hot. Add the black beans, egg, paprika, parsley and oats. 4, Form veggie patties to desired size and place in flour to lightly coat. 5, Place a large skillet on the stove on medium high heat, add olive oil, and when hot place patties. 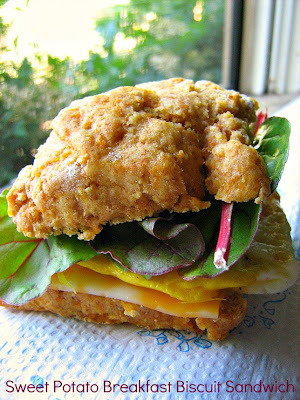 Flip the burger when golden brown, about 3 to 4 minutes and cook the other side the same. Somebody missed me. Maybe even more than one somebody. I actually had a few people urge me to continue to share recipes here. After taking a little break, I realized that I wanted to come back here and talk about food. I love to cook and I love food, so it just makes sense. I had a Roast Chicken disaster in the middle of February and it was really sad. It was quite the debacle and after that happened, I felt like I lost my mojo for a couple of weeks. The defeat of the Chicken made me lose a little confidence in the kitchen and I played it really safe for a little while. Then, I got inspired and decided to try a few things that I had been looking forward to for quite some time. 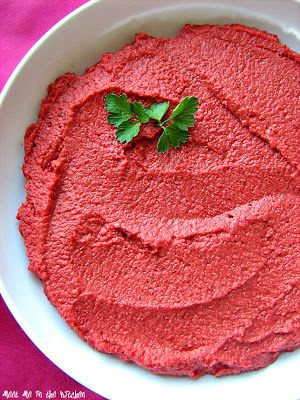 This Beet Hummus was on that list. I love Hummus. I have made every kind imaginable and I love beets, so combining the two didn't seem that weird to me. I pinned a few different recipes and waited for the perfect opportunity to make this lovely dip. One of my best friends was coming over for lunch one day and I wanted to make the best lunch ever. I made this Beet Hummus, Homemade Veggie Burgers (the best one's I've ever had-don't worry, I will share the recipe later), Kale Chips (with Red Russian Kale), and Meyer Lemon Sorbet. This Hummus was fantastic with all sorts of veggie dippers, but it was also really good smeared on top of the Veggie Burgers. I made it the day before we enjoyed lunch together and that made it really easy to pull off a great lunch menu. I would like to try it again using golden beets as soon as possible. It is delicious! as a basis for this Beet Hummus, but didn't follow them completely. 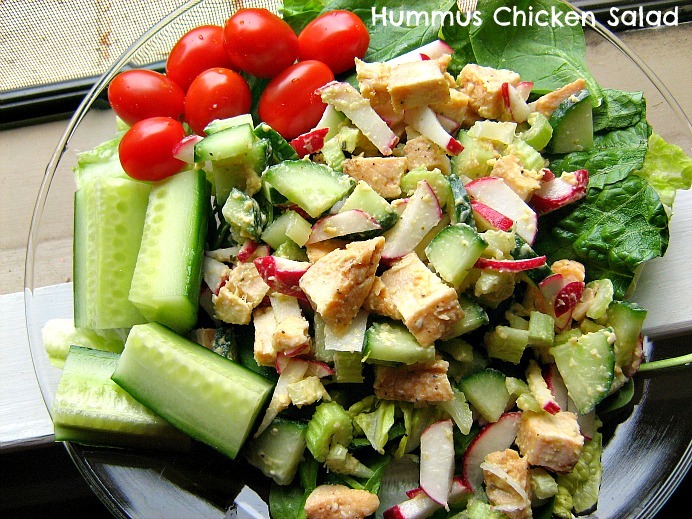 I have made hummus so many times that I know how much of what to add to get the consistency that I want.